My friend Natalie helps run a children’s ministry program, AWANA, at her church. Today is the last day of the AWANA year, and she and her husband wanted to recognize all the volunteers who help make the ministry possible. So, she asked me if I’d help her make some cake balls for the volunteers. 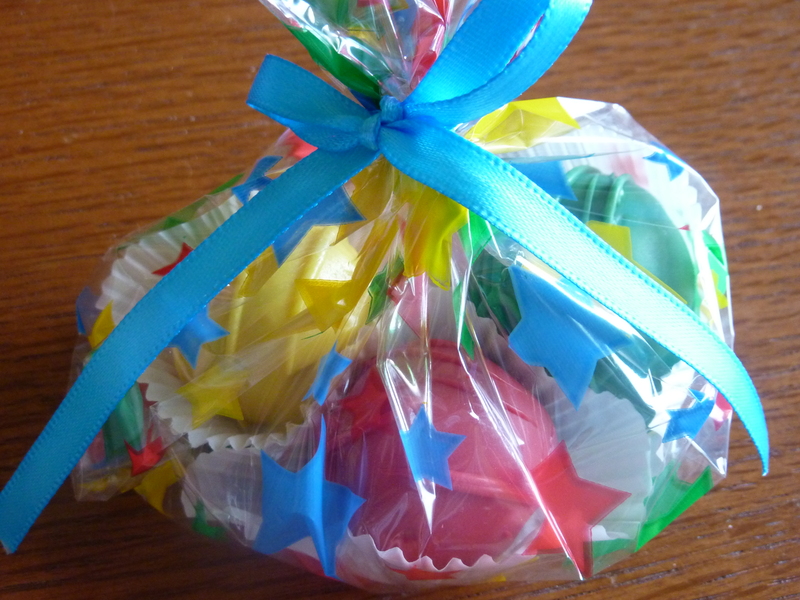 Originally we thought to make one large cake ball per volunteer, but eventually settled on three small ones, in the AWANA colors (yellow, red, green, and blue). This meant that we were going to make 210 cake balls, as there were 70 volunteers. I’ve made 60 cake balls before, but nothing like this. Needless to say, I didn’t sleep well Sunday night. I was in a little over my head, but at least I had help from Natalie, and her friend Esther, who came over for a bit to see how to make cake balls and to help in whatever way she could. Here we are making a big mess. Natalie and I were working in stations. She was putting the balls in the muffin liners while I was coating them. We put some balls in the freezer to harden faster so that is why my Cool Whip is out. I needed the freezer room! Here’s Esther cutting up 70 ribbons. She was fun to get to know. Here is the mess from making that many cake balls. It was that and some dinner dishes. After Eric finished taking all these pictures, I paid him in extra cake balls to wash for me. He was happy to oblige. It may not look like 210 cake balls in 70 different bags, but I promise you, they’re all there! Thanks AWANA volunteers. I know you’ve made a big difference in those children’s lives. And thanks Natalie for letting me help you honor them. It will be quite a while before I want to make that many cake balls at one time! Wow! I’m in someone’s blog. Pretty neat. It was great to learn how to make these cake pops. I hope to do some more. I tell ya, Holly is quite a magician in the kitchen. Thanks for teaching me! Fix your site..it was 225 cake balls plus some cuz we took some home! :) 210 sounds easy next to the actual made. Hee hee! It was such a fun night with you and Esther and I would do it all over again in a heartbeat! Holly, these are awesome!! Friday, at my quilt class, one of the gals brought cake balls on lollypop sticks, with small gormet candy balls on top. There were so cute and tasted yummie. Saturday, she brought the taller cupcakes that looked like sundaes with a short straw in them. Ymmmm again!! Your site is wonderful and it looks like you are having so much fun! They look beautiful too bad I didn’t get to eat one! !